Ray and his wife June are from a small town in Southern Illinois. They have two sons and three grandchildren. Ray started receiving messages from the Blessed Virgin Mary in January 1993. 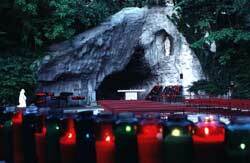 He received many of his messages at the Shrine of Our Lady of the Snows in Belleville, Illinois. 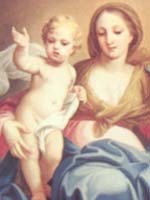 Our Lady appeared to Ray for more than a year. I've included only a few paragraphs of what she said; those things specific to prophecy. Ray has a book out that is available on the internet. I'll try to post that URL as soon as I can. "Do not be afraid. I will be with you always and will teach you." I am the Immaculate Conception, ever Virgin and Mother of God and our Lord Jesus Christ, and mediator between Heaven and Earth. My message to you is the same as it has been over the centuries and is still the same as I have been giving throughout the world today. Pray, Pray, Pray and pray from the heart with total love for God from the heart. Prayer is the only way we can defeat Satan and all his evil works. Prayer is the most powerful weapon you on earth have against Satan and the evil one. There is no known power on earth today that can destroy Satan and his evil ways. Because he is in the heart of every person and spreads hatred in their souls and this brings on wars all over the world today. The world today is in very bad and difficult times. If people cannot come to peace to end all wars, God will step in and bring peace to the world. But as in all wars, many of the good will die with the bad. Pray that this will not come. The only way you can win these wars is through prayer and love and total conversion of the heart, and not with bombs and bullets. When man finds love in his heart for everything that God has created, then there will be peace. Follow the true way of teaching that God and my beloved Son, Jesus, gave you. Do not follow ways and teaching of some people that are going around saying, "This is the way." That is Satan in disguise. Teach others to love and serve God. Spread His love to all who will listen, and through the word of mouth and prayers. There are a lot of people today wanting to listen but they are hearing the wrong things. This is Satan and all his demons at work to undermine people's thoughts to total confusion. Where there is confusion, that is the work of the devil. Where there is truth, there is love and peace. Judge for yourself which is from God, and which is from the devil. If you do not receive the words the same way others do, pray to the Holy Spirit to help you understand as others with the truth. Do what I have told you in all the messages I have given you over the century. First find love and peace and total conversion in your own heart. Live, show and teach others this and how to pray. People must show all our leaders that we want peace and peace with God, and what He stands for, and then, and only then, peace will come. Pray for our Pope, Bishop, Priests and lay people that they do not fall in the web of the evil one. Pray that my Bishops and Priests stay loyal to me and I will give them my blessings in abundance and those who are unfaithful to me will suffer much. Pray for them! Pray that they will bring us back to God in the true words, and to love Him with all their hearts and not be in love with ourselves, and put our pride and feelings first. Go in peace and love God! Traditionally, this devotion goes back to the year 352. According to legend, there was an elderly, childless noble couple in Rome. The couple was wealthy, and having no heirs, desired to use their wealth to further the work of the Church. They consulted Pope Liberius who encouraged them to pray for guidance. During the night of August 4, 352, the Virgin Mary apeared in their dreams and expressed a wish that a church in her honor be built in Rome on the hill covered with snow. The next day, the citizens of Rome awoke to the astonishing sight of the Esquiline Hill draped in a blanket of snow. The childless couple accepted this as Our Lady's answer to their prayers and provided funds for the construction of the Church. This church, the basilica of St. Mary Major, has been restored and refurbished a number of times. The church is popularly known as the first Shrine of Our Lady of the Snows. In 1941, the Oblates of Mary Immaculate introduced the devotion of Our Lady of the Snows to the American Midwest at Belleville, Illinois. An original painting of Our Lady of the Snows by J. Watson Davis of New York shows Our Lady of the Snows in the Artic sky above some kneeling Eskimos. This became the center of a small shrine in the corner of the Oblate seminary. The shrine has since been moved to a place in what is now known as the National Shrine of Our Lady of the Snows. In 1958, Navy chaplain Lt. Leon Darkowski, took part in Operation Deep Freeze II. Before leaving for the Antarctic, Father Darkowski had a medal of Our Lady of the Snows struck and distributed to Catholic Seabees who placed themselves under the protection of Our Lady at a Mass in the Quonset Naval Air Station chapel, North Kingston, R.I.